It appears the president "is assisting a foreign government in a conspiracy to obstruct justice in the political murder of a resident of the United States, and he's doing so because to do otherwise would be detrimental to his business interests." Did Trump Conspire with Saudis Over Khashoggi Murder? 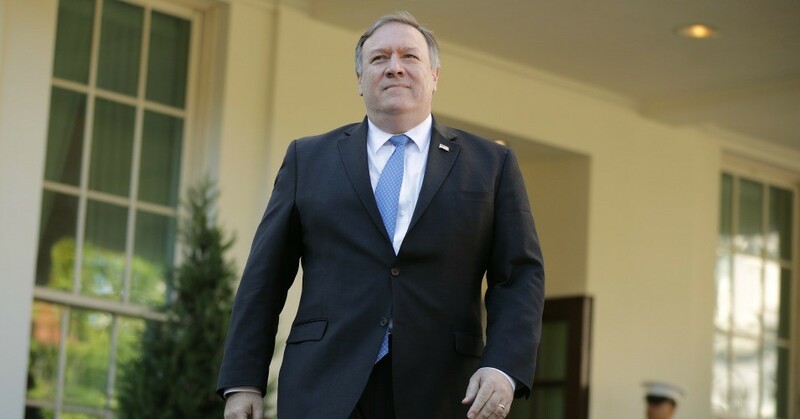 U.S. Secretary of State Mike Pompeo walks out of the West Wing before talking to journalists following a meeting with President Donald Trump at the White House October 18, 2018. As President Donald Trump continues to provide cover for Saudi Arabia while making no moves to hold the kingdom accountable for the suspected murder of Washington Post columnist Jamal Khashoggi, Democratic senators have demanded records detailing any and all financial ties the president has with the Saudis. Noting that the Trump Organization's longtime business relationships with the Saudi government and royal family are well-known and a matter of public record, 11 Democratic lawmakers sent a letter on Wednesday demanding information on whether the Saudis have given the president anything of monetary value since he was elected in 2016—a direct violation of the U.S. Constitution's Emoluments Clause—and whether Trump has discussed potential investments with the kingdom since announcing his campaign in 2015. “It is imperative that [the administration's] sanctions determination, and U.S. policy towards Saudi Arabia generally, are not influenced by any conflicts of interest that may exist because of your or your family’s deep financial ties to Saudi Arabia," reads the letter, which was signed by lawmakers including Sens. Elizabeth Warren (D-Mass. ), Jeff Merkley (D-Ore.), and Patrick Leahy (D-Vt.). On Thursday morning, Secretary of State Mike Pompeo emerged from the White House after briefing the president on his recent trip to Saudi Arabia and Turkey and offered the latest evidence that the administration is not at all interested in holding their ally to account for the alleged assassination of the dissident journalist. The letter was sent a day after the president scolded the Turkish government, the news media, and the international community for suggesting that the Saudis were behind Khashoggi's killing at the Saudi consulate in Istanbul on October 2. Evidence of a murder by Saudi operatives has mounted since his disappearance, with Turkish officials saying an audio recording reveals that Khashoggi was beaten upon entering the consulate, and an investigation inside the building uncovering the fingerprints of a key member of the suspected "hit team" in the case. The Democrats' demands also coincided with a wire transfer of $100 million that was sent to the U.S. from Saudi Arabia on Wednesday night—a payment that one U.S. official told the New York Times was "no coincidence." While Trump said Tuesday that he has "no financial interests in Saudi Arabia," he has boasted in the recent past that he makes "a lot of money from" the kingdom. In their letter, the Democrats wrote that Trump referenced multi-million dollar properties the Saudis have bought from his company, at a rally in Mobile, Alabama in August 2015. The president's clear financial ties to the Saudis—and his repeated lies about the entanglements—amount to an explicit "violation of his oath of office," wrote columnist Charles P. Pierce at Esquire on Thursday. "Right now, at this moment, it appears that the President* of the United States is assisting a foreign government in a conspiracy to obstruct justice in the political murder of a resident of the United States, and it is fair to say that he's doing so because to do otherwise would be detrimental to his personal business interests," Pierce wrote in summation. With evidence that the Saudis have spent hundreds of thousands of dollars in recent months at the president's hotels, from which he has not divested his financial interests, Pierce added, Trump is unquestionably violating the Constitution. And moreover, he wrote, "There is also absolutely no question that this hedging about the murderous Saudi royalty—for reasons that very likely have as much or more to do with his business interests as they do with oil or some vague threat from Iran—is precisely what the Emoluments Clause of the Constitution was designed to prevent." Journalist Jamal Khashoggi's disappearance has hurt the reputation of Saudi Arabia's crown prince, Mohammed bin Salman. The United States received a payment of US$100 million (S$137 million) from Saudi Arabia on Tuesday (Oct 16), the same day Secretary of State Mike Pompeo arrived in Riyadh to discuss the disappearance of journalist Jamal Khashoggi, a State Department official confirmed. Saudi Arabia publicly pledged the payment to support US stabilisation efforts in north-eastern Syria in August, but questions persisted about when and if Saudi officials would come through with the money. The timing of the transfer, first reported by The New York Times, raised questions about a potential payoff as Riyadh seeks to manage the blowback over allegations that Saudi agents were responsible for Mr Khashoggi's disappearance. The State Department denied any connection between the payment and Mr Pompeo's discussions with Saudi officials about Mr Khashoggi, a Washington Post contributing columnist. "We always expected the contribution to be finalised in the fall time frame," Mr Brett McGurk, the State Department's envoy to the anti-Islamic State coalition, said in a statement. "The specific transfer of funds has been long in process and has nothing to do with other events or the secretary's visit." Saudi Arabia, an oil rich monarchy and staunch US ally, has long relied on its financial largesse to persuade partners to support its foreign policy objectives. Western diplomats suspect that the kingdom will also compensate Turkey for its willingness to launch a joint investigation on Mr Khashoggi's disappearance - a payback that could come in the form of large-scale debt relief, strategic buyouts or other arrangements that boost Turkey's ailing economy. Mr Khashoggi's disappearance has hurt the reputation of Saudi Arabia's Crown Prince Mohammed bin Salman, whose close relationship with President Donald Trump's son-in-law and senior adviser Jared Kushner has put him at the centre of the administration's Middle East policy. Turkish authorities say Mr Khashoggi was killed on Oct 2 during a visit to the Saudi consulate in Istanbul to obtain a document required to get married. Mr Trump initially promised "severe punishment"for Saudi Arabia if the US determined that Saudi agents killed Mr Khashoggi. But the president has since floated an alternative theory involving "rogue killers" and compared the case to the sexual assault allegations against recently confirmed Supreme Court Justice Brett Kavanaugh. "Here we go again with you know you're guilty until proven innocent," Mr Trump told The Associated Press in an interview on Tuesday. During Mr Pompeo's visit to Saudi Arabia, the top diplomat and the crown prince smiled for the cameras and emphasised the two countries' mutual interests. When asked if he had learnt any details about Mr Khashoggi's disappearance, Mr Pompeo told reporters:"I don't want to talk about any of the facts; they didn't want to, either, in that they want to have the opportunity to complete this investigation in a thorough way." The Saudi payment to support stabilisation efforts in Syria is a cornerstone of Mr Trump's "America First" strategy, which calls on regional countries to take on a greater burden for security challenges, including Syria. In August, US officials hailed the Saudi pledge and said the US would use US$230 million earmarked to help stabilise Syria for other purposes. 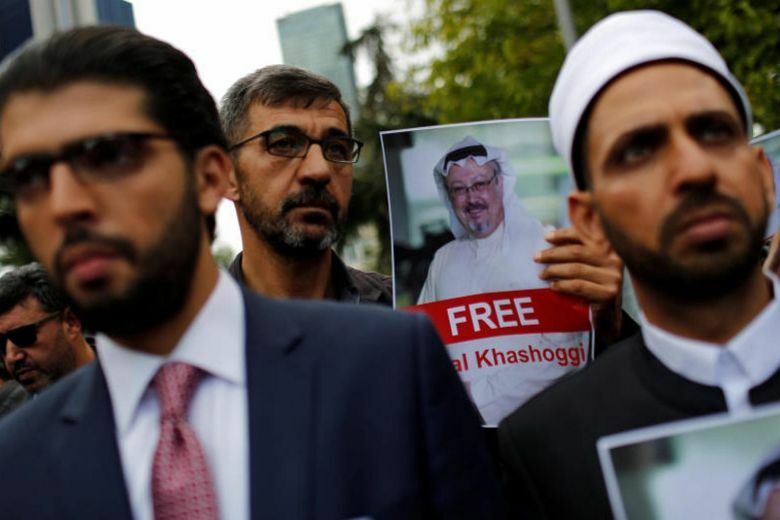 "In all probability, the Saudis want Trump to know that his cooperation in covering for the Khashoggi affair is important to the Saudi monarch," said Professor Joshua Landis of the University of Oklahoma. "Much of its financial promises to the US will be contingent on this cooperation."